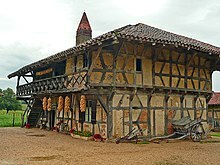 A Bresse house (French: Ferme bressane, German: Bressehaus) is a timber-framed house of post-and-beam construction, that is infilled with adobe bricks and is typical of the Bresse region of eastern France. A large hip roof protects the delicate masonry from rain and snow. The house is almost always oriented in a north–south direction, the roof on the north side often being lower. This configuration offers the optimum protection from the bise, a cold northerly wind typical of the region, which is deflected over the house by the low, sweeping roof on the northern gable end. The living rooms are on the south side, the main façade facing the morning sun. Usually each room has one or two outside doors, so that no space is sacrificed for passages. The large cantilevered roof is supported on corbels or buttresses, the eaves being further supported on a second set of shorter rafters, resulting in a double-pitched roof. The eaves enable equipment or supplies to be stored around the outside of the house and kept dry. They also enable corn cobs to be hung from the rafters to dry out. The countryside of the Bresse is characterized by agricultural buildings; the villages often suffer from overdevelopment; the farmsteads are usually far from these villages, by lakes, streams, woods and where possible on slight eminences. 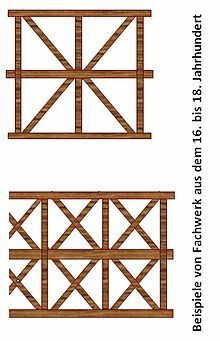 Whilst the timber framing of the 14th and 15th centuries was still simple and large-scale, in the 16th to 18th centuries ever more complicated designs evolved, on one hand to give the building greater stability, and on the other for decorative reasons. Especially popular were crossed struts that formed a St. Andrew's Cross. 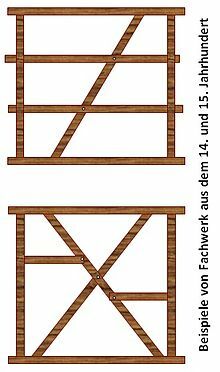 Timber framed buildings continued to be erected until the mid-19th century. Then there was a change: in the southern Bresse rammed earth (Stampflehm) was increasingly used for the walls, which usually had reinforced corners of brick or stone, and the façades were covered with rammed earth. In the northern Bresse, brick has generally been used since the 19th century, albeit bricks of low quality. At the same time, the hips on the gable ends were shortened to create a half-hipped roof or even a simple gable roof, with the eaves on the gable ends disappearing almost completely. Two forms of farmstead predominated. On the one hand there was the unit farmhouse, which was partitioned transversely and where, in most cases, the threshing floor was in the middle of the house; on the other hand there was the two-sided farm with the farmhouse on one side and outbuildings on the other. The main farmhouse was usually oriented in a north-south direction, but there were often variations in which the building was oriented northeast to southwest. When erecting the houses, builders appear to have taken account of the direction of the sun, in particular to ensure that the morning sun shone into the living rooms. As construction activity took place mainly in winter, outside the busy summer season, there was often a deviation in alignment. Very rarely, buildings oriented from northwest to southeast may be found. There could be separate buildings for each of these functions, or the living quarters, fodder store and stables could be arranged one after another to form an elongated building. The living quarters were usually found along the western side of the farmyard. Where the buildings were separate, the threshing barn and stables would be built in succession along the eastern side of the yard. The bakehouse and quarters for the smaller livestock were usually found in the northeastern part of the farm. 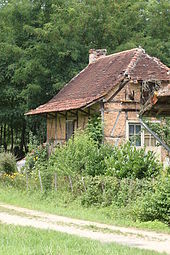 In southeastern Bresse, properties were occasionally built to an angular design. ^ Untersuchungen in Romenay und in den Kantonen Saint-Germain-du-Bois und Pierre-de-Bresse, gemäß L'Habitation paysanne en Bresse. p. 39. G. Jeanton, A. Duraffour: L'Habitation paysanne en Bresse. 2. Auflage. Verlag Société des Amis des Arts et des Sciences de l'Arrondissement de Louhans, 1993.